Amelia "Amy" DeVries, a 24-year-old violinist, is disillusioned with life and love after the collapse of her long-running romance. Weary of endless rehearsals and performances, Amy sets out on a road trip through the Pennsylvania mountains. She leaves her mobile phone behind so life's demands can't intrude on her solitude. She doesn't know, nor care, where she will end up. When her car breaks down deep in the mountains, Amy realizes the flaw in her "no mobile phone" plan. She abandons her car and walks the winding roads, searching for help. Following the smell of woodsmoke and the sound of music, she finds a rustic log cabin. There she meets a young Amishman - and through him a community - that will change her life forever. The Fiddler by Beverly Lewis was published by Baker in May 2012 and is our 13153rd best seller. 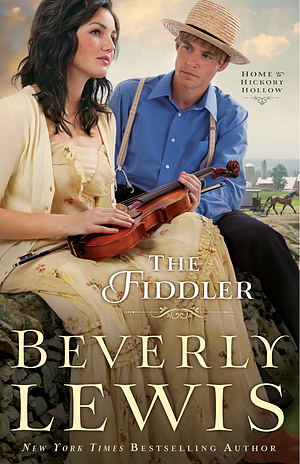 The ISBN for The Fiddler is 9780764209772. This opens the Home to Hickory Hollow series, but stands alone nicely. Amelia Devries finds herself living an artistic double life: she?s a talented concert violinist who?s also very good at fiddling. But fiddling doesn?t fit into the plans of her musician boyfriend, her violinist father, or her agent. When a severe thunderstorm strands her in the rural mountains of Pennsylvania, she takes refuge at a cabin inhabited by Michael Hostetler, a young fence-sitting Amish man who can?t decide whether to take the formal vows to join the Amish community. Her chance connection with Michael allows Amelia an opening into his community, while Michael finds himself increasingly attracted to the outsider. Lewis?s presentation of Amish life portrays the advantages and disadvantages of a community with definite rules and a solidarity that can be both enviable and constraining. The musical motifs offer welcome variation on very familiar Amish themes that Lewis renders in virtuoso style. This opens the Home to Hickory Hollow series, but stands alone nicely. Got a question? No problem! Just click here to ask us about The Fiddler.